In previous posts we have studied different theories that help us in identifying best practices when designing learning solutions. 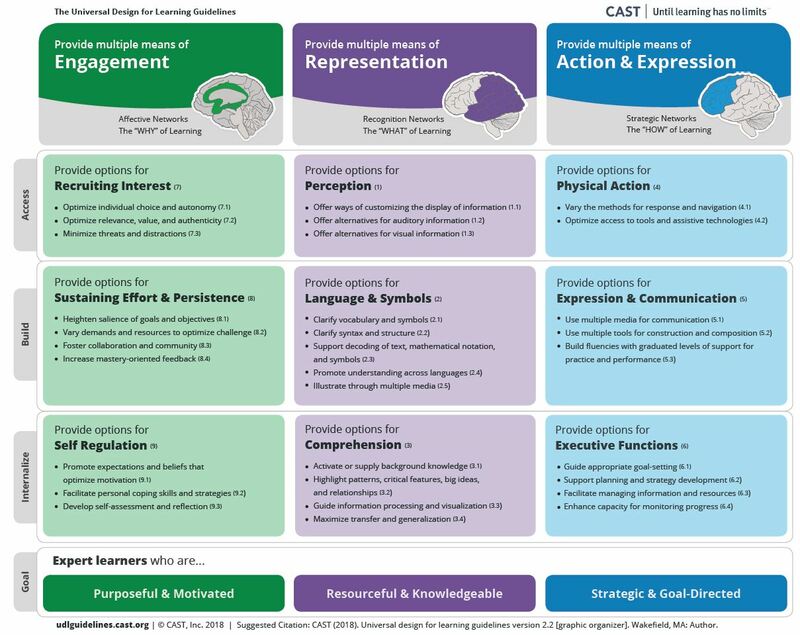 In this article I want to give a summary of “Universal Design for Learning” (UDL) so we can continue building a toolkit with strategies, practices and other resources to help us make awesome training experiences. 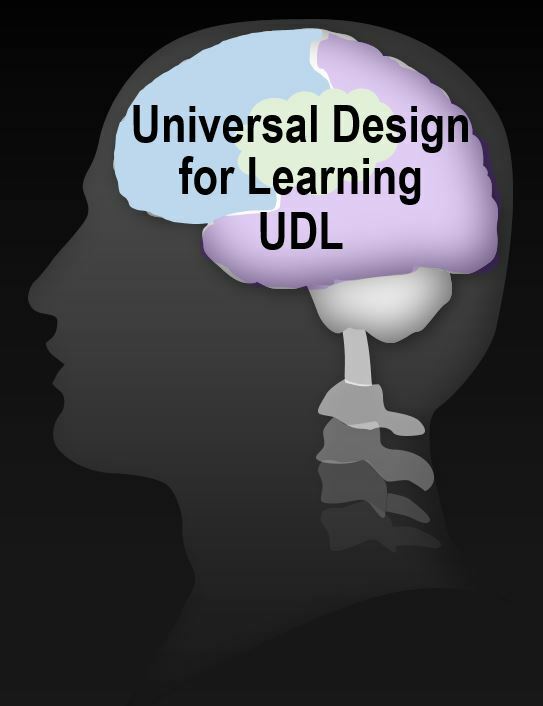 Join me in this article and let’s get an idea of what is Universal Design Learning. Offer options that engage students and keep their interests. Show the information in different ways. Allow your students to approach learning tasks and demonstrate what they know in different ways. 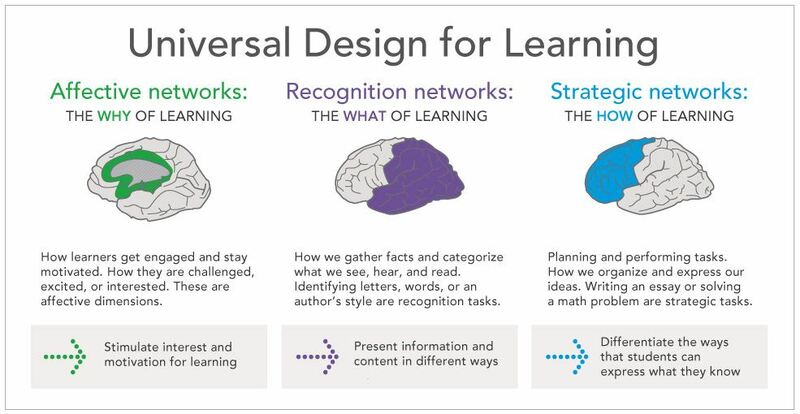 Universal Design for Learning (UDL) is an educational framework based on research in the learning sciences that recognizes that the way individuals learn can be unique. The concept of Universal Design for Learning was inspired by the universal design movement in architecture and product development, originally formulated by Ronald L. Mace at North Carolina State University. In our learning space, universal design means that curriculum should be designed to accommodate all kinds of learners. The UDL framework was first defined by David H. Rose, Ed.D. of the Harvard Graduate School of Education and the Center for Applied Special Technology (CAST) in the 1990s. UDL is based on research on how the brain works and how humans learn. 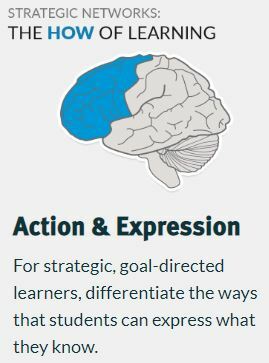 But in order to make it easy for us to understand and put good strategies into practices, UDL comes with a framework or a way to translate research and innovation into practice. This framework consists of guiding principles that originate guidelines for creating and choosing tools, methods and practices based on the learning environment, circumstances and the learners we are working with. Multiple means of student engagement. Multiple means of representation of information. Multiple means of student action and expression. These Principles are fantastic guidelines and ideas that we should follow when we build learning experiences. Engagement: designers should infuse multiple ways to motivate learners, such as providing opportunities for learners to pick how they want to study the subjects in order to build their interest. 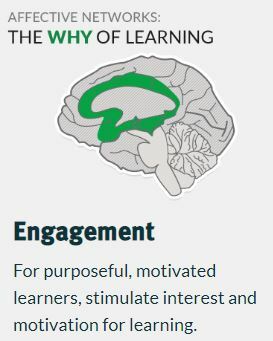 You can also refer to the articles “Motivation in eLearning – Understanding the Adult Learner” and “ARCS Model and Instructional Design – Motivation in eLearning” to learn more about engagement and motivation. 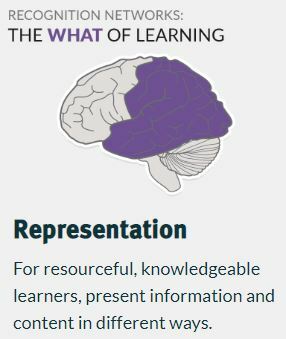 Representation: designers should provide information in multiple formats for learners — audio, video, interactive text and other multimedia elements so learners can access content in a manner they like based on their learning style and strengths. Action and Expression: designers should create multiple pathways for learners to engage with materials as well as multiple options in demonstrating understanding of new knowledge, skills, and abilities. For example, add different knowledge check points and different forms of assessments. These principles have specific guidelines that give us practical examples on how to apply UDL. Stay with me to see what we can do in our classrooms to adopt this approach. Provide options for self-regulation:Promote expectations and beliefs that optimize motivation. Facilitate personal coping skills and strategies. Heighten salience of goals and objectives. Vary demands and resources to optimize challenge. Optimize individual choice and autonomy. Optimize relevance, value and authenticity. It can be difficult to design learning activities to engage all the students in the classroom (face-to-face or virtual), because some students might enjoy spontaneity and a more active participation, others might prefer structure and a set routine. I am a shy person, it is my nature, so I remember getting stressed when the normal structure of the classroom was changed for something different. But then, when faced to a new challenge I ended up enjoying it. My recommendation is to try and try different options and let your students choose. Let them work in groups based on their preferences and build little communities that later can share their experiences with other groups. Always support your students when facing new challenges to help them get more confident and invite them to try new things as well. If it doesn’t work, discuss and analyse with them what went wrong. Those reflections will promote self-regulation and will get your students learning about how they learn (metacognition). Activate or supply background knowledge. Highlight patterns, critical features, big ideas and relationships. Guide information processing, visualization and manipulation. Support decoding of text, mathematical notation and symbols. Offer ways of customizing the display of information. Offer alternatives for auditory information. Offer alternatives for visual information. When I was a school student (long time ago! lol), content and course topics was mainly represented in text form. We didn’t have different means to explore topics. Now, the majority of schools have technology, Internet and computers to support different learning activities and then explore other means. For example, a class of geography could include videos, 3D models built with a 3D printer, text books, applications with games, class discussions, etc. Build one topic using different representations. Some concepts will be captured by your students with one way or another. Using different formats will reinforce concepts, facilitate the acquisition of new knowledge and you will increase the changes of your students being able to retrieve that new knowledge later on in their class. If your school doesn’t have the technology, there are still options, such as let your students build their own resources, paint the object of study, create a board with the parts or elements and present the board to the rest of the class, build with play dough or other materials and write about the journey and learnings. Support planning and strategy development. Enhance capacity for monitoring progress. Use multiple media for communication. Use multiple tools for construction and composition. Build fluencies with graduated levels of support for practice and performance. Vary methods for response and navigation. Optimize access to tools and assistive technologies. For action and expression it would be ideal to set goals with the students, let them complete a chart with they want to achieve and learn at the end of the class or activity. Include some form of monitoring progress, so the students can practice more self-regulation and self-assessment. We want to help our students become experts 😀 so create different activities for assessments and try not to leave evaluations to the end. Include assessments or knowledge checkpoints at different times during the sessions so they can put in practice new concepts before advancing to a new topic. This strategy promotes scaffolding as well which will help your students build a strong foundation of knowledge before progressing to more complex subjects. Graphic Organiser udlguidelines.cast.org | © CAST, Inc. 2018 | Suggested Citation: CAST (2018). Universal design for learning guidelines version 2.2 [graphic organizer]. Wakefield, MA: Author. A way to optimize teaching to effectively instruct a diverse group of learners. Based on insights from the science of how people learn. Flexible in how students access material, engage with it and show what they know. UDL aims to change the design of the environment rather than to change the learner. When environments are intentionally designed to reduce barriers, all learners can engage in rigorous, meaningful learning. Multiple means of representations (numeric and symbolic, a physical way such as toys to play with numbers, visuals, text, etc). Multiple means of action and [removed]variety of activities and assessments at different points in time). Multiple means of engagement. Make learners motivated (use multimedia, spark interest, include relevant topics and elements students already know). Do you like this framework and principles? Have you seen it practice lately? Would you like to put it in practice? I was a special education teacher for 25 years. I wish this would have been around then. This is good, sound instruction. I like the research behind it and the step by step analysis. This could be applied in the work place also. Very thorough and well written article. This post is very informative, I like the way you have integrated video into the subject. You have given me a new insight into how teachers today are meeting the needs of children in the classroom. This is absolutely brilliant, and glad I stumbled upon it. I am trying to learn the basics of Vietnamese and thought seek out more information on “how” to learn such a complicated language.